Florida’s Space Coast has some tremendous world-class golf courses. They run along the Indian River Lagoon with varieties and skill levels of many sorts, and they are playable all year with our temperate climate. In short, people retire down here for a reason. Of late, however, there have been some new inventive twists on the great old game, and all of them have found a home and become quite popular along the coast. Both Foot Golf and Smash Golf are relatively new creations and growing recreations that combine two common sports into one great one. Smash Golf, to start, is an ingenious combination of tennis and golf. Open to the public and playable at either Duran Golf Club in Viera as well as Turtle Creek Golf in Rockledge (which has some super rates going this summer for the game: only $7.50 for 9-holes, racquet rental included), this sport is both relaxing and entertaining. 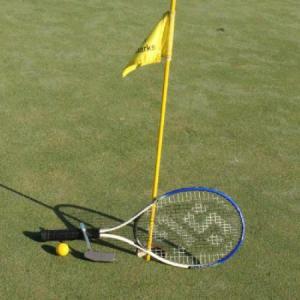 Basically, instead of using a golf club, you play the course using a tennis racquet and specially designed colorful soft balls. It’s a leisurely way to spend the afternoon that requires much less of the technical proficiency actual golf requires. To put it a different way: you’ll have fun the first time you play. We promise. Foot Golf is another recent fusion with much the same idea, only this time the combination is golf and soccer. Florida’s own MLS team, the Orlando City Lions, is said to have practiced using the sport. Courses around Florida’s Space Coast have yet to add full-time capabilities for this, although Mallards Landing in Melbourne is hosting a tournament in late June, but no matter, with this sport, making your own course is fun and simple. Just dig a hole on the beach, being mindful of potential sea turtle nests, or in a backyard, get a few hundred yards away from it with a soccer ball, and boom, you’ve created a course of foot golf. Rules are the same as regular golf: fewest needed kicks to the hole wins. Another, perhaps easier to assemble DIY golf sport that’s really caught on around the beaches locally, is Ladder Golf (a.k.a flingy pongy, a.k.a Wrally Ball, with more nicknames by day). Played with a simple PVC pipe set up that you can build yourself or buy in most large box retail stores, this is a fun way to claim to be an athlete while standing in the Florida sun with a beer in your hand. From campsites to the shoreline, games break out locally every weekend. Two golf balls are attached by a string, and the basic concept is to toss them onto the “ladder” (the PVC structure) so that they wrap around. Points for most wraps. And if you’re the creative type of family, come up with your own unique rules, names, and point systems: it’ll make a lasting memory. Unconventional, but outdoors in the fresh air and full sun on Florida’s Space Coast, these golf-ish games make for some good times and unique experiences. Few things are better than sports on the beach with friends and family: you can’t miss this putt.